Trump’s agenda of regulatory rollback, infrastructure spending and tax cuts is all but stuck in Washington’s ideologically fractured environment. In Q2, the economic and political situation in the US began to feel a bit stuck. Tax reform remains stalled out behind the broken down bus of health-care reform. The dream of easy policymaking under single-party control of government has given way to a nightmare of conflicting ideologies inside the Republican Party. And, investors continue to struggle with stretched valuations across a number of different asset classes, due in large part to ultra-low interest rates for an ultra-long time. The IMF recently downgraded US growth prospects – while upgrading those of Eurozone and Asian economies – on the premise that sweeping fiscal reform seems increasingly unlikely in the medium term. The Fed, however, sees it differently. Rather than looking for excuses to maintain loose monetary policy as it has done for the past decade, it suddenly appears to be looking for excuses to tighten. This has a number of implications for the economy and capital markets. When parsing the Fed’s words, it is clear that Janet Yellen has two primary concerns. One is jobs. At 4.3% unemployment, the Fed has expressed concerns that tightness in the labor market is unsustainable and will likely lead to inflation down the road. (Data aren’t telling this story yet; in fact inflation remains remarkably subdued. The Fed has excused the absence of inflation pressures on transitory issues like falling prescription drug prices and cheaper cell phone plans). The other, ironically, is recession. If the Fed tightens short-term rates to deal with the hot jobs market, it risks creating an inverted yield curve – a term used to describe higher short-term rates relative to longer-term interest rates – typically a harbinger of recession. By selling some of the longer-term debt on its balance sheet as it recently promised to do, the Fed can manipulate the longer end of the yield curve upward, maintaining banks’ incentives to lend and helping bolster corporate profit margins, extending the economic expansion. It’s entirely possible, in other words, that the Fed can raise rates to preempt inflation without derailing the economy (possible is the operative word here as the Fed admits that the exit from quantitative easing is unchartered territory). Beneath the surface of the Fed’s newfound willingness to fight inflation, however, is a more important message. Rather than focusing on financial stability, as has been the case under quantitative easing, the Fed is indicating it will be more focused on monetary stability going forward. The so-called ‘backstop’ role the Fed has played in recent years – stepping in with rate cuts and various QE programs any time markets have come unhinged – may very well be in doubt if the central bank’s primary focus is on fighting inflation. Inflation, the thinking goes, can itself be a huge source of financial instability should it get out of control. It’s not hard to imagine what the world might look like without a Fed standing by to buffer every twist and turn in the market. For one, it will mean (for better or worse) that market forces and economic fundamentals will play a greater role in determining prices in capital markets, rather than being so heavily influenced by central bank policy. Investors should like that, as it will allow them to be rewarded for differentiating between fundamentally good and bad companies. However, much like the period from 1994 through 1999, it will mean greater market volatility. No backstop (and more volatility) could also mean less risk taking by market participants; take away seatbelts and drivers should adjust their behavior accordingly the thinking goes. Finally, without the Fed standing by to cut rates any time the market drops materially – a tool that has prevailed since Greenspan successfully used it to buffer the 1987 stock market crash – the typical inverse relationship between bonds and equities could break down. Bonds go up when interest rates go down, so they’ve been a reliable portfolio offset to equity risk in a world where the Fed reliably intervenes. Without the Fed backstop, it could mean a rethinking of traditional portfolio construction. It’s still not crystal clear that this is where the Fed is going, but we will continue to monitor its behavior for this possibility given the signals we have seen so far. Should falling prices prove to be transitory as Yellen asserts and we revert to the historic positive relationship between a tight job market and inflation pressures, we will begin to modify portfolios to include greater inflation protection. This will mean potentially adding a small allocation to commodities and emerging markets equities. Both remain relatively cheap from a valuation perspective when compared to large cap US equities and both have generally been good long-term inflation hedges in the past. Equity, credit and bond markets crept upwards in Q2, even in the absence of clear policy direction. Strong earnings growth made up for stalled policy and a lack of improvement on the economic front, with reported earnings for the S&P 500 up nearly 14%. Volatility meanwhile, a measure of the market’s fear, fell to near historic lows. It has never been a good time to put money to work when the market is complacent about risk and we think this is particularly true now given the many flash points of risk on the horizon: high valuations, changing central bank policy, geopolitical confrontations, rising global populism and a less stable political situation in the US. Could a President Pence, Ryan or whoever else down the succession line do a better job of pushing through all the tax cuts, regulatory rollback and infrastructure plans than our current leader? Perhaps, but we can’t really know and the process of getting from here to there would likely be rocky. 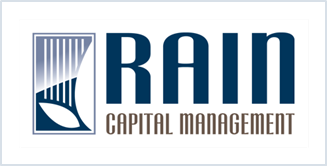 Rain portfolios held up well during the quarter and have been competitive against their benchmarks on a year-to-date and on a one-year basis. Looking forward, we remain focused on building portfolio diversification that can withstand a number of different economic and political scenarios. We are now fighting risk on two fronts, however; both the possibility of a sudden shock to the system from one of the many flashpoints mentioned above, but also the very real possibility of experiencing the slow burn of inflation. From a defensive standpoint, Rain portfolios are well prepared for these scenarios. From an offensive standpoint, we intend to begin adding strategies can benefit from a reflationary scenario. However, we are not inclined to mistake the current low growth, low inflation and stuck policy environment for a goldilocks economy – not too hot, not too cold – as some have suggested. Just right, after all, implies a sense of moderation that is absent in today’s picture.